As important as my garden is to me, I sometimes get weary with the seemingly menial tasks that are required to tend it each day. My allotted two hours on many days is spent checking for bugs, harvesting, seeing how things are doing, and pulling a weed here and there. Other days I check for bugs, harvest, and plant. Depending on what else is going on in my life (especially when experiencing physical pain), there are days that I really wish I didn’t garden. I’m guessing that you have days you feel the same way. What makes us give priority to gardening? What motivates us to keep on? What causes us to find a way and the time to do what’s necessary? I think it depends on WHY our garden is important to us and how we envision what it is we want to accomplish by gardening. Is it a hobby? Just something to do? Just want a few home grown tomatoes? Do you feel that you can get the “same” food at the grocery store for less work? Growing stuff just to give it away? Is it your main source of healthful food for your family? Do you know enough about what’s happening in big agribusiness to know how important it is to grow your own if you possibly can? There’s a story about an architect who designed and built a beautiful cathedral. The analogy between the cathedral and our gardens can help to show us what a difference our reasons for gardening can make. More importantly, it shows us what a difference our reasons can make in us and whether or not we keep on keeping on. The architect approached 3 of the men who were working breaking rock in the construction of the cathedral. He asked each of them what they were doing and why? The first man said he was breaking rocks because he was paid a sum of money each day for his efforts. The second said he was breaking rocks to build a wall. The third said that although he could make more money for less effort elsewhere, he was working there to help build a beautiful cathedral that would inspire everyone who saw it. And furthermore, he wanted to learn how to build a cathedral of his own. Each individual has to determine the importance of his reasons for gardening, just as these men determined their reason for breaking rocks. The fellow who just thought he was breaking rocks didn’t envision anything except a bit of pay at the end of the day. The fellow who said he was breaking rocks to build a wall envisioned a bit more than just pay. But the fellow who was helping to build a cathedral and learning to build his own, imagined as a future possibility something much greater than just the menial tasks of the day. Bill and I rely on our garden to supply the food that sustains us most of the year. The more I educate myself on what’s going on with the food industry, the more I realize that our health is dependent to a large degree on my garden. My reasons for gardening make my garden of the utmost importance to me. Giving it up is not a consideration that lasts longer than a minute. Snap beans to the left. Pepper to the right. Ginger in the front right. Picture taken September 5th. I’ve spent 36 years finding ways to cut down on what has to be done for success in the garden. I’ve shared a lot of it with you, because I want you to be successful in the garden and be able to do it with all the other hats you wear; just as I have over the years. But when it comes right down to it, it’s your reasons for gardening that will make the difference in your garden. Bill caught me tending my garden in my usual bent over position. (Top left center – pink top.) (I can’t kneel.) These two pepper plants are in the row to left as I enter my garden. They stayed only 6 inches tall until mid July. They are now almost 5 feet tall and loaded with small fruit. Also visible are tomatoes, basil, sorrel, lemon balm, summer pointsetta, and peas coming up to the right of the peppers. Picture taken September 5th. 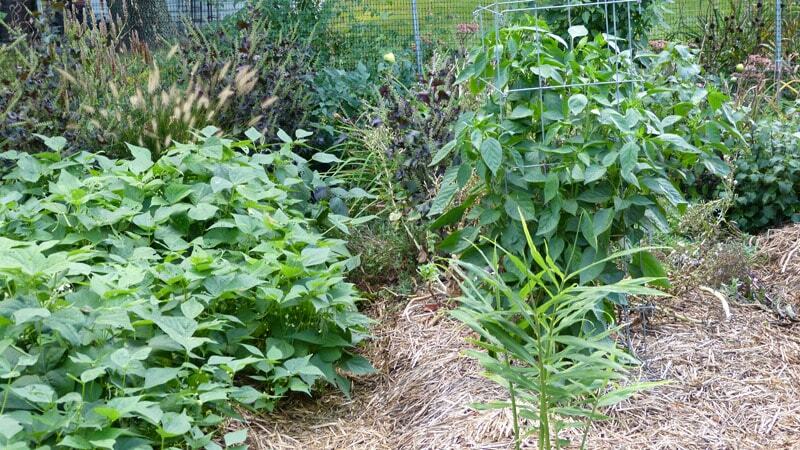 The health benefits of organic gardening cannot be denied! U “rock”, Girlie!! Blessings abound from Above, and I have to add one other comment: Ur garden is probably the best prescription for good health, also. Thank U! Great and inspiring article. Thought provoking. I love that you are helping me grow my own health food store right out my back door. I did not know you could grow ginger! What does it need? Where did you get your root? Or did you start with the plants (transplants)? What kind of peppers are those? Wow, I had to back up and look hard to see you in among the foliage. My guess is that you’d be found in that exact location even if you had your own gardener or access to the best of the best produce. I believe that there are people who just have to have their hands in the soil no matter what. I know I garden because I can’t not. Even when I lived in London, I had a row of pots in the back yard – just couldn’t help it. Had to back up again…. the ginger! Tell us more!!!! Thanks for sharing the link to that article Pat. Might help someone strengthen their reasons for gardening. Thanks Barbi. And yes, I agree, my garden is probably the best prescription for good health. Toni, (and Sandra) this year is my first trying to grow ginger. Jack, friend and reader in New Jersey has had wonderful success growing ginger and after seeing his success (in pictures) I wanted to try too, as I use a lot of it. Jack starts his early in his green house in a pot. After the weather warms and they’ve sprouted he plants it in the garden. He told me it likes water and he keeps a can of water handy to water his when things get really dry. I used a sprinkling can of water on the ginger during this drought, but that’s all I could spare. Hopefully we’ll still have some warm weather left that will allow it to grow more. I can hardly wait to see the size piece I end up with! Farming Bear, I thought I had planted 2 California Wonders in that bed, but they’re a bit tall for California Wonders. As soon as the peppers get larger I’ll be able to tell if they’re California Wonders or one of my favorites: Corno di Toro or Carmen. They get really long, are thick walled, and are delicious red! Sandra, you might be right. My grandmother was like that! Love this analogy, Theresa! what an inspiration you are! “I think it is nothing short of miraculous how others can cause us to be more committed, more dedicated, give us renewed zeal and enthusiasm, help us to strive to be better and to make a difference — just through their friendship and what they do and say. Glad if now, I can pass it along. 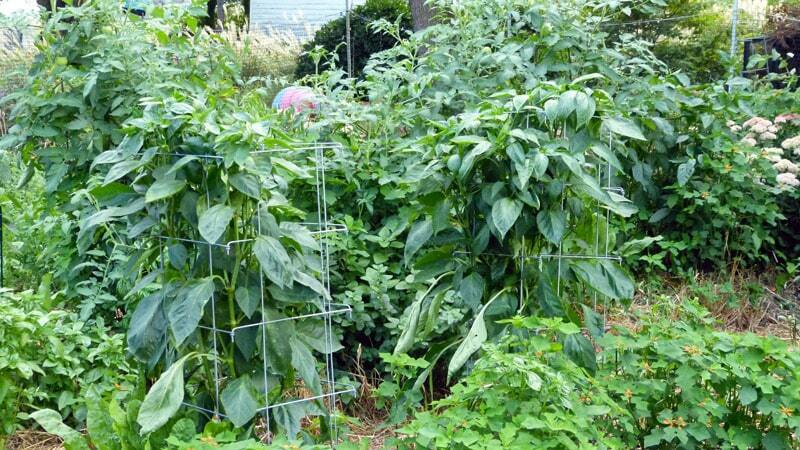 My neighbor just last week had to give up the garden she has cherished for the last 30 or so years. Her diabetes and heart condition robbed her of the strength she needed, she said. I personally tried to convince her to keep the garden, because without the garden her health status will certainly decline very rapidly. I have other neighbors who are still working their gardens at 85 or 90, and it’s a wonderful way to get old. Wish you had been able to convince her Millard. Great post Theresa! If I could just hunt, fish and garden, I’d be living the dream! 🙂 Although I live in the heart of farming country, with farm stands every 1/2 mile in every direction, organic fruits and veggies just aren’t available. Last year, I planted 2 small chunks that weighed an ounce or 2 each around mid March in 8″-10″ pots in the hoop house. It took 3-4 weeks for the first shoots to break through. After spending another month or so in the hoop house the plants and soil were lifted and taken from the pot and planted in the ground (mid May). The garden soil was amended the prior fall (high in OM and leaned to the sandy side). It started off very slow, but seemed to really thrive in the hotter, more humid months. I plan to grow it again next season the same way but would also like to try experimenting by starting a few roots even sooner in the house, before putting them into the hoop house. Another thing I plan on doing is holding off on the mulch until the really dry/hot weather arrives. I found out Ginger is very slow growing and needs a long warm season. I think a weed free but bare soil to allow it to warm sooner would have made a big difference. My harvested ginger roots sized up at around 9 ounces each if I remember correctly. THANKS for the details Jack!